This article documents my recollections of the Ruahine setion (Wharite to Kuripapango) of a walk from Wharite near Palmerston North to Te Harato on the Napier-Taupo road. Longview track • By Jono51. Having booked 10 days off work in late October 2006, I decided to find how far I coud get from home on foot in that time, heading north from Palmerston North along the Ruahine Range. Lunchtime on the 9th day found me at Te Harato on the Napier-Taupo road, with some 230km of the most enjoyable walking in my 5 years in New Zealand behind me. Living in the South Island, we are occasionally derisive of the allegedly tame and crowded tramping that the North has to offer - but this walk rectified that. Weather included snow, fog, rain and sunshine, and the route ranged from bush-bashing to routes, and tracks. High peaks, scree slopes, and crumbling ridgelines provided plenty of challenge, whilst untracked tussock tops, and river-flat routes and marked bush-tracks gave variety and pleasent walking. The constantly changing environment was a novelty: the leatherwood and regen. of the Southern Ruahines, faded into mature podocarp and beech, then marshy tussock tops, hard rocky ridgelines, scree and crumbling rock, tussock again with stunted beech and finally the claypan and manuka of the northern limits of the range. With the exception of a night on Wharite, every night was spent in comfortable and well kempt tramping huts, yet not a soul was seen. For anyone with tramping and route-finding experience, 10 days to waste and the need to put some kilometers under the boot, I'd highly recommend a south-north walk of the Ruahine ranges. Severe gale-force winds made for a sleepless night on Wharite, and eager to escape this exposed spot an early departure before breakfast seemed in order. Cloud and fog restricted views of the endless leatherleaf of the Southern Ruahine tops to 100m – but the message was clear: travel off track would be very difficult. 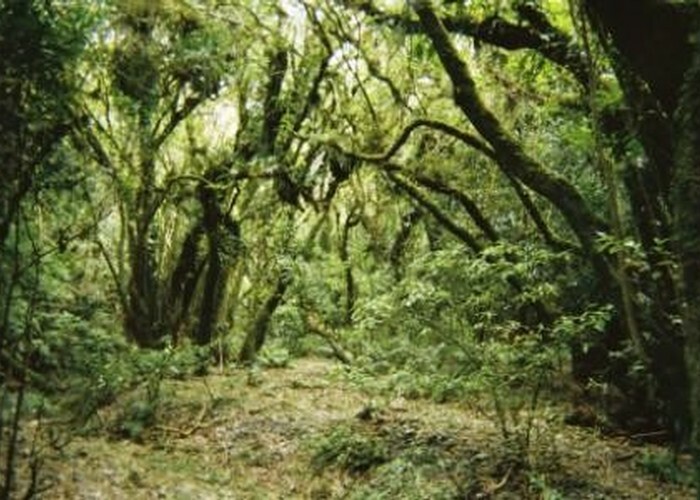 Leatherleaf bushes were over 3m tall, and closely intertwined making passage underneath, the main means of progress in the Northern Tararuas, near-impossible. The day’s objective was modest: Kiritaki hut some 10km away along the main ridge – but the thick scrub and bad conditions meant that a longer route seemed advisable, hopping from valley to valley on the eastern flank of the Ruahines, sheltered from the rain and winds by the bulk of the range. Well maintained tracks led over the first two valleys past the site of Coppermine Hut to the Mangaatua Creek. Here, on the lower slopes, regenerating bush replaced the leatherleaf of the peaks, and a relatively easy 1.5km track-less climb to the next main ridge was possible by following a side-ridge up from the creek. The tops between Mangataatua and Raparapawai however, were covered with thick dense scrub and hard going. Relief then, to find the remains of an old marked track leading west to a well-maintained canvas bivvy. To my delight a recently cut track led from here down to the Raparapawai Creek – but confusingly was not to be the track indicated on the map – and in fact came out 2km further down stream! The gravel flats of the Raparapawai made for easy travel, and though plentiful fresh deer-sign was present along the creek, none were spotted. Even after a half-day though, the climb from Raparapawai to Kiritaki seemed unkind: a steep 300m ascent to within sight of the hut, only to lose half of that hard-gained height dropping to a saddle before climbing to the Kiritaki ridge. Back in leatherwood country, the well maintained track was welcome. 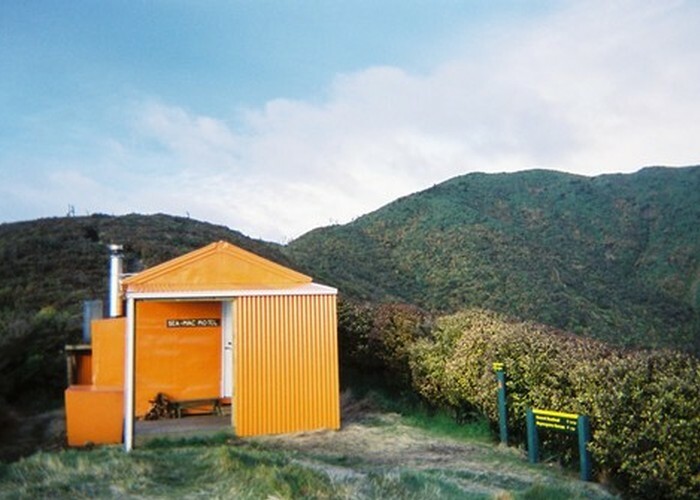 Kiritaki hut (6 beds, wood-burning stove) was one of many excellent huts on this walk. 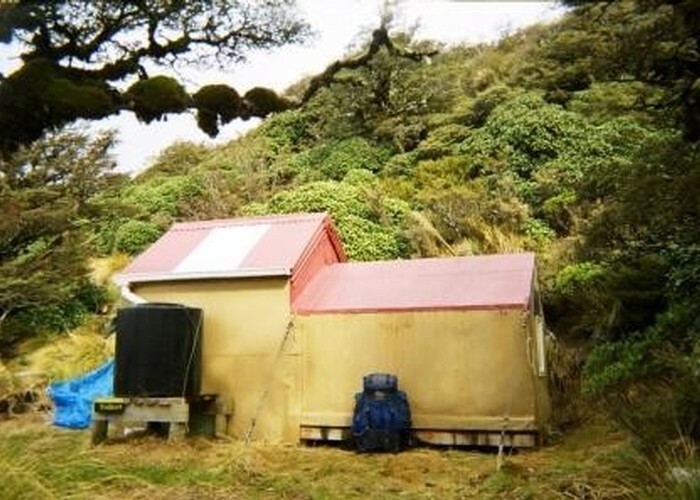 Looked after by a group of locals, it is the only hut to remain in the Southern Ruahines. Congratulations must go to them for a welcoming, well-maintained, comfortable hut. After setting wet clothes to dry over the fire, and cooking tea (mushrooms and rice), I barely lasted until dusk before falling into a much needed sleep. Keretaki Hut • By madpom. Licence: cc by. The original plan had been to follow the ridgeline from Kiritaki and join the end of the Takapari Road. However, experience the previous day with the thick leatherleaf had taught me to respect the Ruahines. 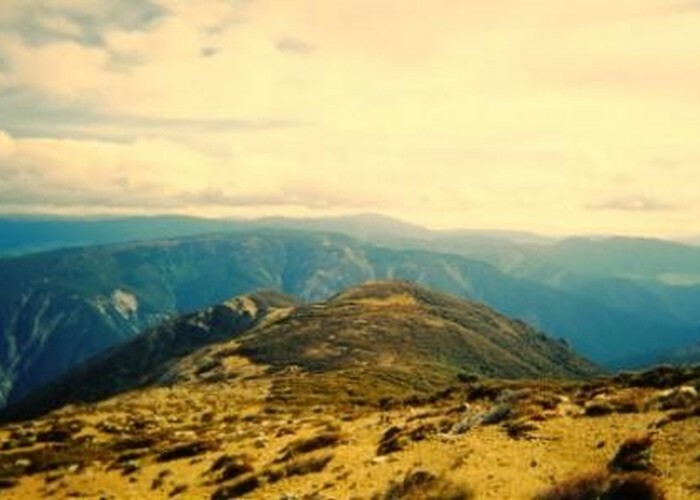 Traveling the tops is not the way to walk the southern Ruahine’s – whilst it is clearly possible to do so, it would be a slow and tiring approach – not suited to my aim of traversing the length of range. As such, day 2’s route started along the Kirtaki – Kumeti track to Mangapuaka Stream. Two deer on the ridges were a welcome sight: the first a yearling stood at a distance of 10m and allowed its photograph to be taken! The second, a large stag was wiser and presented little more than a glimpse of rump as it disappeared into the bush. The crossing of the three untracked ridges north of Mangapuaka could only be described as unpleasant. 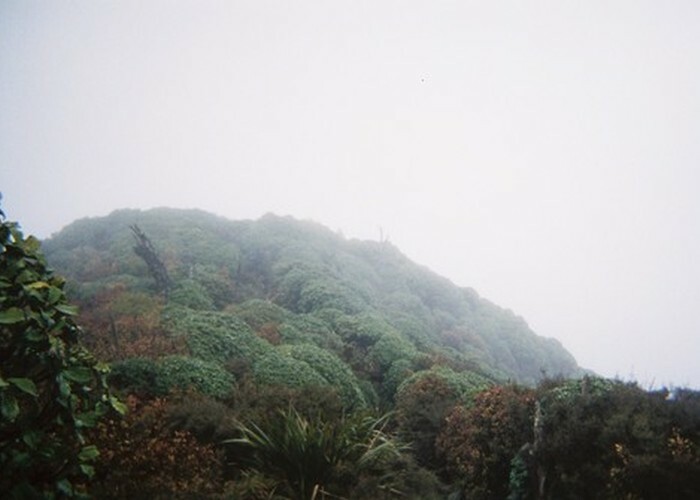 Regenerating bush covered the slopes, interwoven with steeplejack creepers and frequent belts of stinging ongaonga. Several hours of hard going, of untanging creepers from my pack, of unintentional slides down hillsides (1 dislocated thumb to show for it) and cursing of the Southern Ruahines in general were required to reach the Rokaiwhana Stream, from whence rivers head conveniently north-south and are joined by well maintained tracks. The beginning of clear tracks and convenient streams coincided with the start of mature totora and rimu bush, and the end of tangled regenerating scrub! Eastern Ruahine bush • By madpom. A pleasant walk along rivers and tracks thus lead to Standfield Hut (6 bed, woodburning stove), for an afternoon tea to provide energy for the climb over the saddle to Cattle Creek. Thankfully the clinging hookgrass of my last visit to this track was gone, and the crossing was relatively easy –back into regen. along the Tamaki Ridge, low bush providing glimpses of the farmland flats and Dannevirke. Standfield Hut • By madpom. Cattle Creek hut, nestled on flats beside the stream, was a very welcome sight after a long day’s tramping. More welcome for the fact that it marked the end of the dense leatherwood and untracked country of the Southern Ruahines and the beginning of maintained tracks or clear rock and tussock tops which lay ahead. Mushrooms and rice. My favorite. Extremely heavy rain overnight and in the morning lead to a late 10am departure from Cattle Creek – though thankfully the creek remained low despite the weather. The 15 minute climb back to the ridgeline provided ample opportunity to warm up despite cold winds and continuing rain. The track north along the ridge was, sadly, not maintained. Not one route marker was seen beyond the Cattle Creek junction, and in many places the track is unclear. To add to this, this section of the walk fell off the corners of two of my maps and as such navigation was left to instinct. Just when I had convinced myself that I’d lost the track completely and was about to drop to the creek, I came upon the ruins of the hut at Birch Whare. Beyond, the track deposited me at the creek, still with no clues as to which onwards direction to take, and about 6km to go till my next map began. Consulting the compass, the best option appeared to be to follow the north branch of the creek below the hut (the Mangatewainui, it transpired), which ran due north. After 1km upstream in heavy rain, a DOC signpost indicated a track on the true left to Makaretu and Leon Kirvig Huts. Whilst neither of these huts featured on either the map I’d just left, or that I was heading on to, the Makaretu River lay to the east of the ridge I was aiming for. Hope renewed, I started what turned out to be a 4.5km, 700 vertical meter climb to the watershed. Horizontal rain and wind had determinedly set in by the time I reached the 1232m summit, and visibility was back down to a couple of hundred meters. However, a welcome signpost read ‘Longview Hut 3hrs’ – the very place I was aiming for (less welcome was a signpost 45 minutes later reading ‘Longview Hut, 3.5 hours’, and one 20 minutes after that reading ‘Longview Hut 4 hours’) . On a nice day the walk along this ridge must be beautiful, with views down the length of the Pohongina and Makaretu valleys, out on the clear tops for the first time in the Southern Ruahine’s. However, on this day the walk it could only be described as dismal – dropping in and out of cloud-forest, from freezing on exposed sections of ridges, to sweating in sheltered sections of cloud forest. Slowly, however, the ridge climbed until the bush was left behind and boggy tussock tops dominated, the path already under up to 1’ of water. The rain turned to sleet. Clinging to the windward side of a particularly exposed ridge above the very headwaters of the Pohongina, Longview hut momentarily revealed itself through the cloud and snow. A sight for sore eyes – but what? No chimney? With no fire this would be a cold and miserable evening and a worse day tomorrow in wet gear. No chimney indeed – but something even better: gas heating. A luxury I’d often derided, now very welcome (Longview Hut: 12 beds, gas heating & cookers). My gratitude was wearing somewhat thin however, after the 15 minutes of repeated efforts required to work the air through the gas lines before a pilot light could be coaxed into lighting, allowing the fire itself to be turned on. Longview Hut • By madpom. A scattering of snow greets me in the morning, rapidly turning to slush as I trudge up the path from Longview into the boggy tussock tops, across the Pohongina Saddle and towards Otumore (1519m). This will be the first of six 300m+ climbs of the day. Snow starts to fall again as the summit nears, but without the wind of yesterday it flutters rather than stings, and soon stops. The days walk is formed by a series of northerly ridges, and interconnecting east-west saddles as the watershed cuts left and right between the various catchments. No single ridge dominates this area. Beyond Otumore a long gentle descent and another side-step west – crossing the headwaters of the Tukituki. The Tukituki valley heading north is one big landslip, with many smaller slips draining into it. Crumbling black rock is everywhere. Ribbons of regenerating scrub mark spots of relative stability. The day’s second peak of Tuamatataua (1431m) marks the point where the marshy tussock of the past day is replaced by rock, scree and thin, dry grass. North again, Daphne ridge leads to Howett’s Hut, for an early lunch. Soup accompanied by pitta with tomato puree and marmite. Luxury. Howett’s hut (6 bunks, wood-burning stove) is tucked in a hollow on the sheltered east side of Daphne Ridge. The bushline touches the ridge at this point and firewood is ample. 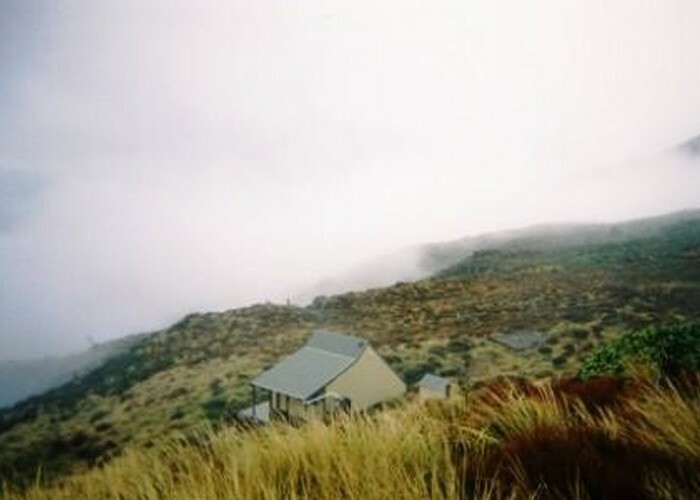 Views down over the plains to Ongaonga are obscured only by cloud. Looking west reveals the snowcapped Tiraha, marking the start of the infamous Sawtooth Ridge. Howletts Hut • By madpom. From 1300m at Howlett’s the climb to Tiraha (1668m) is eased by the sight of two red hinds descending the long ridge opposite. The winter snowline is encountered at 1500m, just as the going gets steep. Progress is slow as the wet snow rapidly compacts to slick slushy ice and a route has to chosen sticking to the scrub where support is available. On the ridgeline the snow has been blown clear, and progress is easier – but the summit is under cloud and I’m denied a view of the Sawtooth in its entirety. On descending to the ridge, however, it proves aptly named. A narrow, knife-edge ridge some 3km long, it is punctuated by 5 sharp rocky knobs forming the teeth of the saw. Scree and cliffs on either side frequently drop to the valley floors 500-600m below with little in the way of obstacles to slow a fall. Some knobs are sheer, and force detours across these screes. The view would be heartstopping in good weather, but in the mist and cloud on this spring day, only glimpses of the fate below are revealed. Thankfully the wind remains a slight breeze: anything more would make this crossing impossible. Sawtooth Ridge • By madpom. From its low point at 1400m the ridge widens and climbs to the rocky summit of Ohuinga (1686m). A narrow ridge heads NW towards Wooden Peg and Purity Hut, but the watershed leads briefly NE, before descending back to1400m for another broad saddle. A 5th steep climb follows to Broken Ridge which progressively narrows until it becomes nothing more than a crumbling line between two scree slopes at its peak at Paemutu (1682m). Ignoring the fallback option of Waterfall Hut, I descend to another narrow precipitous ridge and a final climb to the trig at 1715m, the day’s high point. Here on the bare gravel tops another feature of the northern Ruahines awaits. Patterns of small and large stones decorate the flat tops, sorted presumably by the action of frosts. Lines and waves dominate, though in places polygons and circles of larger rocks can be seen. These features are to become more common as the climate becomes more arid during the remainder of the journey – peaking on the Kawekas where rocks up to 10cm in diameter take part in these designs. The long, gentle descent north east is spoiled by a brief steep climb to reach the beginning of the descent to the Waipawa Saddle, where the days journey must leave the watershed and descend 2km to the Waikamaka Hut (sleeps 8, wood-burning stove) in the valley below. Possibly the only hut in the Ruahines to boast a light bulb and switch (though no cable to connect the two) the Waikamaka is a place of character, and a welcome rest after the hardest day’s tramping of the trip so far. No mushrooms left, so salami Bolognese for tea! Not the same. Today was designated a rest day, with an easy 8m walk along the ridge from Sunrise Hut to Sparrowhawk being the only thing on the agenda. However, the late departure from Cattle Creek days earlier means that I’m a hut behind plan, and a longer walk lies ahead. The climb back to the Waipawa saddle is considerably easier than the tired stumbling descent of the night before, but there the easy going ends. From there the climb to the day’s first peak at 1625m, is up 300m of loose scree. Too exposed even for tussock, the flat peak and saddle beyond towards Te Atuaoparapara are dominated by course rock and lichen. Ahead Te Atueoparapara drifts in and out of morning cloud. But for entries in the hut book read the night before, I’d not have believed the ascent was possible. As it is, the route lies at the limit of what could be called ‘tramping’. Te Atuaoparapara • By madpom. The cloud clears to sunshine, and not a breeze is felt during the climb. The route ascends the pyramid peak up its southern ‘ridge’ – formed where two scree slopes on the east and west flanks meet. Only two outcrops of substantial rock indicate that the peak is formed of anything but loose gravel. The east side is too steep to traverse, and the west traversable on all fours, or briefly, with momentum. Even that friendlier face steepens to cliffs 50m below. The only option appears to be straddling the steeply climbing ridgeline itself, dropping to the west only to avoid the two bluffy outcrops; keep moving to win the fight with gravity, sending showers of small rocks into the valleys below. To say that reaching the summit was a relief is an understatement: fifteen minutes of rest on the summit was not enough to calm trembling knees, due only in part to the effort of the climb. The ascent of Te Atuaparapara from Waipawa Saddle was a highlight of the trip, but not one I will be repeating in a hurry. I recommend the ridge 1km downstream of Waimakaka Hut as a safer alternative, and would never recommend the saddle route in anything but perfect weather. 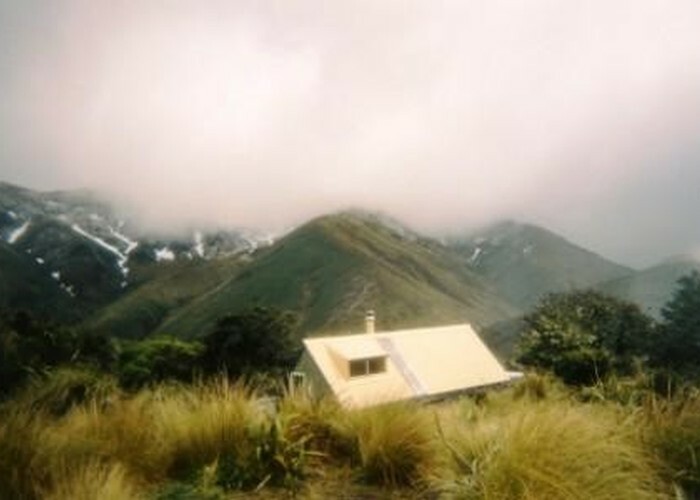 The northern descent of Te Atuaparapara is a gentle stroll down a broad rocky ridge, and after a short climb beyond, Sunrise Hut comes into view below and to the east. I decide to forgo the 1km descent to the hut, and have an early lunch on the Armstrong Saddle, enjoying the first day of sunshine of the trip. From here the ridge north to Sparrowhawk is a series of short climbs and descents through rock, tussock and low scrub. It’s only 2pm when I reach Sparrowhawk. Lying to the east of the main ridge, Sparrowhawk Biv is one of the more comfortable bivvies of the Ruahines – like the rest, it sleeps two on mattresses on the floor, but has a roofed entranceway with its own door, providing shelter and space for cooking and to sit (sleeps 2, no fireplace, water tank). Sparrowhawk Bivouac • By madpom. Licence: cc by. I’d never plan a day like Sparrowhawk to Dianne’s hut. For a start it’s 32km along untracked ridges and over 14 significant peaks. In fact, the day was due to end at AranyaHut at the head of the Makaroro Valley. I just got carried away. The character of the Ruahines changes north of Sparrowhawk. Forest is almost exclusively beech, and tarns dot the broad ridges and tops. 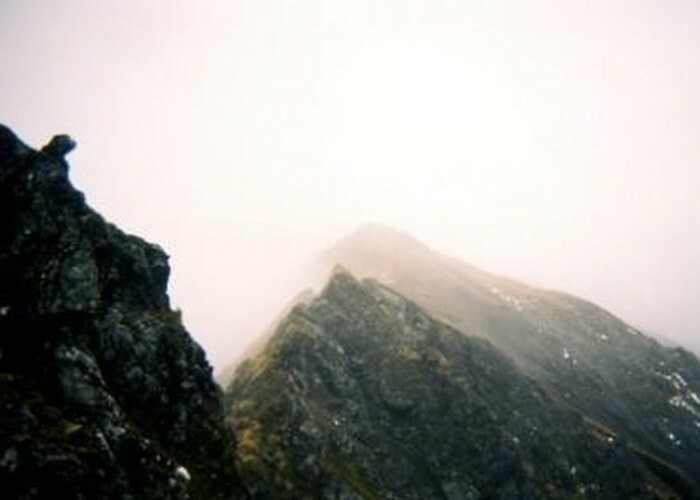 From Sparrowhawk you climb the conical Oprupo, follow broad ridges past frequent tarns over Te Atua Mahuru and Ina Rock. The ridge narrows briefly before Tupari, guiding the tramper onto rotten crumbling rock on the east face, before abandoning him there (I made this error despite having made the same mistake in the same spot last time I was here). Regaining the ridge, the climb to Tupari is the only difficult one of the day, between thick scrub on the west and unstable scree on the east. The extremely basic Kylie Biv lies on a ridge to the east of the peak. Sleeping two, it is so small that even sitting up inside is impossible. Having no windows, only 9 small drillholes in the door provide ventilation. It may well have saved somebody’s life in terrible conditions – but the conditions would have to be truly terrible to merit spending the night there (camping outside seems a more comfortable option). Tupari Peak • By madpom. After lunch (more sunshine) I press on past numerous tarns, and patches of snow. The watershed branches north-east off the main ridge, and I follow it over Piopio, pt 1407 and pt 1396. The ridges are reminiscent of Otago: stunted beech clinging to the sheltered eastern flanks as high as the ridgeline, short dry tussock and rock on the west. Both the leatherleaf of the southern Ruahine’s and the totora and rimu of the lower valleys are absent. A clear and worn track has followed the supposedly untracked ridgeline since Sparrowhawk, but pt 1396 marks the start of the day’s first official marked trail. After 10 minutes of forward and backtracking reveal no sign of either markers or track, I follow the ridgeline east though the beech forest, across the saddle and onto the flat, grazed summit beyond. Here finally markers begin, and we I splash through the muddy, cattle-trodden trail and descend to Aranga Hut (4 beds, fireplace). Aranga is a private hut, but open for use by all. Clearly the visitors or residents are not great fans of DOC: anti-DOC graffiti is carved into the walls, and the bunks appear to be made from old DOC track distance signs (explaining the lack of such outside). It’s only 2pm, and seeming early to stop I push on in glorious sunshine towards No-Man’s roadend and hut. This starts as a pleasant walk along a well maintained track through beech forests and clearings – but as the track later climbs towards the tussock tops of Ohawai, the cloud moves in. With visibility down to 50m the frequent warratahs are a great aid, and only a handful of times do I need to rely on the compass. However, it’s still a strange feeling crossing the featureless tops with no indicator of progress and no company but the mist. Ironically, the cloud lifts as I reach the roadend and drop to No-Man’s Hut. No-Man’s Hut probably owes it’s survival to the fact that it’s privately owned: lying at a roadend it is almost unique to have remained whilst others have been removed by DOC. It also belies the myth that all road-end huts are vandalised and uncared for: the floor is carpeted, the beds comfortable and the shelves full of numerous odds and ends, utensils and food. Fierce signs warn that the route along the watershed to Taruarau Biv passes over private land and is closed, and so I abandon the ridgeline which I have followed faithfully since Makeretu and descend to Diane’s Hut. As I descend I look at the boulders on the hillside above, and think how this wouldn’t be such a great place in an earthquake. 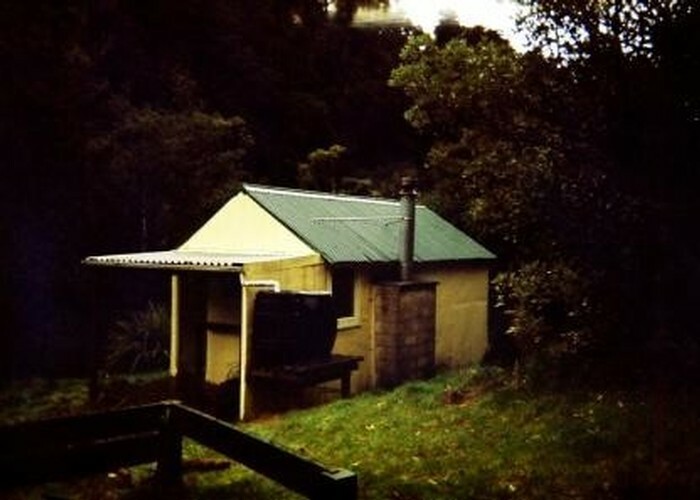 Diane’s Hut (6 beds, wood-burning stove) is another lovely Ruahine Hut. The concrete floor appears unwelcoming, but the stove is the best I have yet to meet – and has my wet clothes dried and boots starting to melt in minutes. The hut was built by a local family in memory of their daughter, and clippings about her and the hut give a special feel. An earth-tremor at 3:40am is all that disturbs my sleep. Thankfully the boulders remain where they are. Day seven is both a happy and sad day, in that it marks the achievement of my goal to walk the length of the Ruahines, but also the necessary departure from this range I’ve come to love. 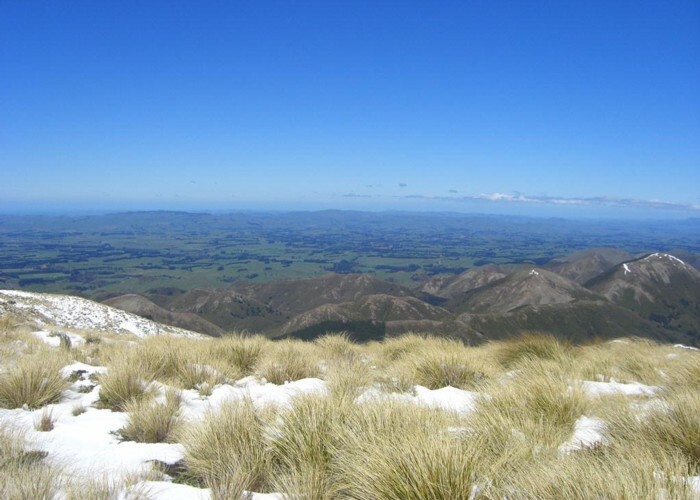 From Dianne’s (750m) the track climbs steeply to the final ridge near Taruarau Biv at 1180m. Even here, it feels as if the Ruahines have been left behind: the dry Manuka vegetation and clay-pan landscape of this northernmost ridge are more reminiscent of what lies ahead in the Kawekas than of the leatherwood, the marshy tussock, the crumbling rock and screes or the beech forests creeping the ridgelines of the previous days. Taruarau Valley • By madpom. Two gems remain, however, before the Ruahines are done with. Descending through sandy gullies and claypans, the track drops to the creek at Shute’s Hut. Set in a large clearing, this 1920’s stone-built hut is the best of the walk, and it seems sad that not to be spending a night there. Build and inhabited for many years by Alex Shute, it still contains the original visitor’s book. All woodwork and furniture are rough-hewn from local timber, and a large, stone fireplace dominates the far wall. Only the corrugated iron roof is imported. 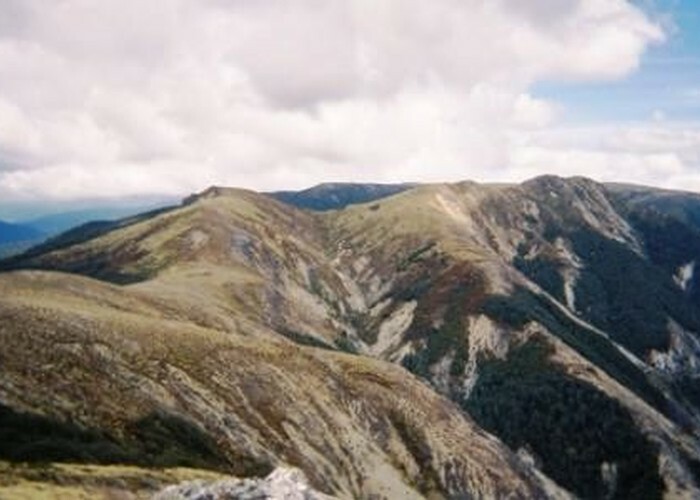 The second gem lies 1km beyond, and marks the border of the Ruahines and Kawekas. The Taruarau River valley is dominated by cliffs and steep beech forested slopes. But beneath them, alongside the clear river, grassy flats and clearings provide a beautiful spot to camp or rest. Trout jump in the river, and deer-sign is abundant on the flats. Wading the river, the track climbs again over 600m to the pine-forested tops that cover the plateaus of the eastern Kawekas. Crossing the plateau the track passes in and out of pine and beech forest before descending to the Comet Roadend and Comet Hut. From here, after lunch, a long trudge along gravel roads remains to reach Kuripapango and the start of the Kawekas proper. The sun is hot and not a cloud is in sight – and I begin to regret my haircut of two weeks earlier as my scalp slowly burns. Snow, wind, rain and fog I was prepared for, but this sunshine is unexpected. I end up resorting to wearing my woolen beanie despite the heat. On the map, Kuripapango boasts a DOC office and a campground – and so I hope for a shop, or at least a vending machine with something cool and sweet to drink. However, the DOC office turns out to be an unsignposted farm building in an unkempt paddock, and the campground to be a flat grassy area between the Gentle Annie Road and the river. Unwilling to spend the night in the presence to such trappings of civilization as roads and traffic, I push on into the Kawekas. But that’s another range and another story. www.freewebs.com/hellmission/ Just read it again and I can relate to everything you have said!!! The Southern Ruahines are the worst part of the park for offtrack travel! Good picture of Te Atuaoparapara when we went up it it was zero visibility which is just as well! www.freewebs.com/hellmission/ Have you finished the Kaweka Version? swindlar Great to read of an epic adventure in the ruahines - lucky with the weather over the tops sections - i.e. no wind. Myself and 4 mates completed a similiar trip at the end of 2003. 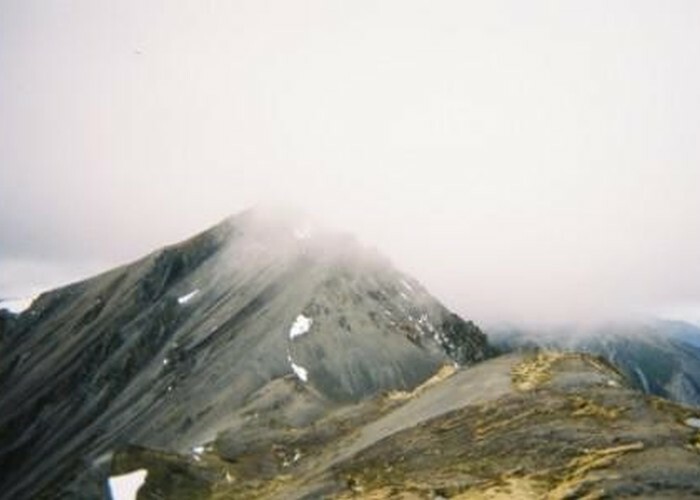 We walked from the tongariro crossing to wharite but took a leisurely approach i.e. 25 days instead of 9. We were pushed off the ridges by the weather alot also. Highly looking forward to the next tale. Added 15 January 2007 by madpommadpom. 20 revisions, most recently 2 July 2007 by madpommadpom. 648 views in the past year (54 per month).